This article will appear in an upcoming issue of The Smart Manager, India's first management magazine. You can be an innovative company and still go bankrupt. Take Kodak for example. They were a pretty innovative company, but that didn’t prevent them from going bust. Despite inventing the core technology used in digital cameras today, Kodak’s technology innovation wasn’t enough for the company to figure out a business model that could be a central piece to their future growth strategy. Companies have to execute their existing business model well and simultaneously reinvent themselves constantly in order to stay relevant. Academics call this structure the ‘ambidextrous organization’. These organizations improve their existing business model while creating an organizational space to invent future business models at the same time. Kodak focused only on R&D, which was insufficient for reinventing the future. It’s a phenomena we see often and we can firmly say that no leader wants to experience a Kodak moment where innovation doesn’t prevent a company from going bankrupt. Although this is difficult to achieve, we do believe that companies can intentionally design an innovation culture that discovers new growth engines, reduces the risk of experimentation, and increases ROI on R&D. We do stress that this is an additional culture that lives alongside the execution culture. But to make that happen you have to recognize that your invent culture will have very different skills, processes, and incentives from your improve culture. We encourage companies to allocate a percentage of their R&D budgets and for seriously exploring new value propositions and business models. Outcomes: What are we trying to achieve? 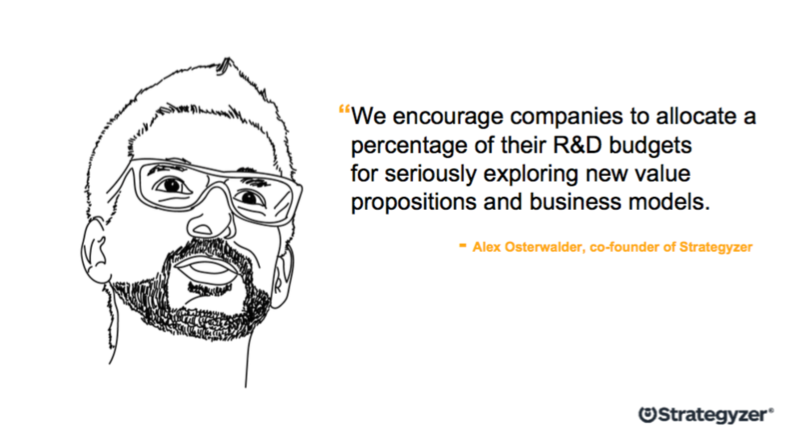 Start by thinking about the outcomes you want for your company within this innovation culture. What are the concrete results you want to create? Let’s say you want your company to reduce innovation risk; get a higher return on any R&D being performed; and build new growth engines. On a managerial level, you’ll probably want to retain your talented teams, and build a company that’s designed for the future. Before you go any further, it’s important to start by focusing on one outcome at a time. Map out the behaviors, enablers and blockers that produce the outcome, and then move onto another outcome. Behaviors: What do we have to do? If you picked “reducing innovation risk” as the first one to tackle, the next step is to map out some behaviors that people need to perform in order to achieve that outcome. For example leadership may encourage teams to test the assumptions underlying their ideas, rather than writing refined, but unproven business plans. You’ll want your company to value evidence over opinions, your company will need to move fast and be agile to change, and you’ll want to incentives or rewards for experimentation. On a managerial level, other behaviors that encourage an innovation culture include celebrating learning from failure. This behavior can also encourage more people inside your company to chose innovation as a career path, and not see experimentation as career suicide. Another good behavior could be that the execution engine of your company collaborates with your innovation engine by sharing resources, knowledge, and even budgets. Enablers and Blockers: How do we make this happen? The behaviors of teams and individuals inside your company is the result of certain enablers and blockers. The enablers will allow desired (or undesired) behaviors to take place inside the company, and the blockers will prevent desired (or undesired) behaviors from taking place. Those blockers sound a lot like habits that work in an execution or “improve” culture, don’t they? But an “invent” culture needs enablers that encourage invention. For example leadership can provide support throughout the company to give legitimacy and power to intrapreneurs responsible for managing the search for new value propositions and business models; and they can allocate sought after resources. By championing methodologies like design thinking, or tools like the Business Model Canvas and Value Proposition Canvas, leadership can enable the right process and skills development for teams to design, run, and manage agile business experiments. You have to have the right enablers to encourage the right behaviors to expect the right outcomes. We really do believe that you can’t just slap a list of phrases on the wall and expect your employees to enact and embrace them as values. 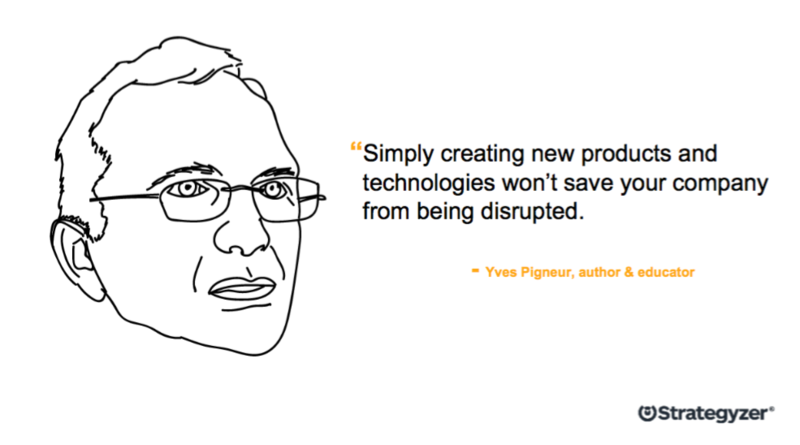 Your innovation culture can be intentionally designed. Because companies have such a hard time reinventing themselves, we tried to figure out how we can help companies intentionally design an innovation culture. That’s why we teamed up with Dave Gray, founder of XPLANE and helped him develop the Culture Map. The exercise of mapping out the outcomes, behaviors, enablers and blockers can actually be visualized and recorded within this simple tool. You can use The Culture Map to map out an existing or desired state. You can use it to communicate your culture internally. And finally, The Culture Map can be a constant reference point as teams and individuals implement or scale the enablers and behaviors to achieve specific outcomes. You’ll want to assess how well your company moves from its improve side to the invent side. Ask yourself where you are when it comes to leadership, culture and process, and organizational design. Has your culture enacted enablers and behaviors that result in the “invent” culture you desired? Has the company moved from a “likely to be disrupted” state to a “constant innovation” state? Has leadership moved the needle to support experimentation and learning from failure? Has the culture and processes resulted in the use of design thinking and strategy tools? And lastly, has your organizational culture encouraged skills development or improved incentives and rewards for innovation? What’s the relationship like between your “improve” culture and “invent” culture? Download your own free Culture Map, to kick off an innovation culture inside your company. It all starts with getting a few key people in the room to discuss the outcomes, behaviors, enablers and blockers that influence your organizational culture.